New Hampshire Federal Criminal Defense Lawyers - Oberheiden, P.C. If you have received a grand jury subpoena, target letter, or have been made aware of a pending federal investigation against you or your business in Concord, New Hampshire – do not delay, contact Oberheiden, P.C.’s New Hampshire Federal Criminal Defense Lawyers right away. Federal criminal trials are extremely serious matters and unlike in state cases, the federal criminal justice system does not offer parole as a possibility. There are no second chances in a federal criminal trial, and federal offenses carry severe penalties. Your next step could be vital, so call us today for a free consultation from an experienced federal litigation attorney. Our New Hampshire federal criminal defense lawyers are proactive and never waver in their resolve to help their clients regain their freedom, license, and avoid charges. We will explore all possible options in order to restore your way of life and defend you against federal inquests by the government. Negotiation of a plea deal is one strategy, but our attorneys have convinced numerous federal prosecutors to drop charges outright, even after a federal indictment has been issued. Oberheiden, P.C.’s team of attorneys makes sure that our clients always have the most up to date and necessary information in order to make wise and strategic decisions regarding their case. When you hire our attorneys, a relationship of confidence and trust starts and never ends until we get the result you want. Even though there are numerous stages that come before an indictment (such as the investigation, search warrants, administrative subpoenas, pre-charge resolution, and intervention) – we will begin our summary of the process at the indictment stage. An indictment is utilized by the government as a formal means to issue charges in federal criminal cases and usually means that the U.S. Attorney’s Office has presented enough credible evidence to a grand jury to find “probable cause,” to implicate you in a federal crime (or crimes). Oberheiden, P.C.’s New Hampshire federal criminal defense lawyers understand that in order to help our clients, an internal investigation needs to take place. What might have caused the federal officials to investigate you or your business? What sort of information was provided to the government? How (and which method) did the government request this information with? Did the government follow proper procedures before, during, and after the issuance of warrants and subpoenas? Who else, if anyone, is the government targeting in your case? Once this information has been obtained, your defense team can start to build an effective defense strategy, which should happen fairly quickly. An arrest or indictment does not necessarily signal that you are headed to court. Even if these events take place, a favorable resolution can still be achieved during the lengthy pre-trial process. A proactive defense team will utilize all the opportunities on the table and attempt to resolve your case before it even goes to trial. A few of the strategies that our attorneys utilize are: poking holes in the U.S. Attorney Office’s case, raising various legal and factual arguments, and challenging the government’s investigative procedures. Negotiating with the Assistant United States Attorneys (AUSAs) assigned to your individual case is a large portion of the pre-trial stage in federal criminal litigation. Our attorneys know how to communicate effectively with federal prosecutors and agents because this is a vital component in obtaining a pre-trial release, reduced charges, or reduced sentencing (or dropping charges entirely). In addition to negotiation strategies with the U.S. Attorney’s Office – your New Hampshire federal criminal defense lawyers will need to undertake other legal maneuvers, such as: filing motions, responding to motions, attending pre-trial hearings, and partaking in a multitude of other formal legal procedures. This could be crucial work because it often leads to charges being dropped, evidence being excluded from trial, and negotiation leverage being utilized. An experienced federal law firm understands that preparation is key, and if your court date is approaching with your case still pending, it will be an absolutely crucial step. This preparation usually involves cross-examining the government’s witnesses, presenting various legal defenses to the judge or jury, and questioning the government’s evidence, before waiting for a verdict to be rendered. Even if you are found guilty, your team still has the opportunity to protect you during sentencing, and reserves the right to challenge any outcome of the trial on appeal. If your case does indeed go to trial, your attorneys still have a chance of negotiating a plea deal, or discovering evidence that warrants the termination of the proceedings prior to the actual verdict. The Granite Mountain State is part of the United States Court of Appeals for the First Circuit (in case citations, 1st Cir.). In the United States District Court for the District of New Hampshire, federal prosecutors are tasked to enforce federal law on behalf of the U.S. Department of Justice. New Hampshire contains one federal district, the United States District Court for the District of New Hampshire (in case citations, D.N.H.). This district locates federal courthouses as well as branches of the Department of Justice, so-called U.S. Attorney’s Offices. The U.S. Attorney’s Offices employ federal prosecutors, also referred to as Assistant United States Attorneys (AUSA). The United States District Court for the District of New Hampshire (in case citations, D.N.H.) 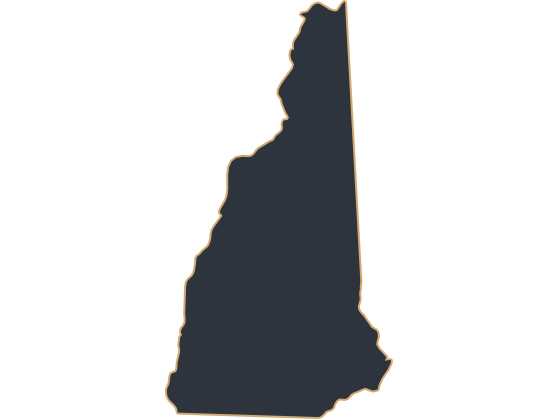 covers the counties of Belknap, Carroll, Cheshire, Coos, Grafton, Hillsborough, Merrimack, Rockingham, Strafford, Sullivan, and Windsor, and it hosts federal courthouses and U.S. Attorney’s Offices in Concord (55 Pleasant Street, Room 110, Concord, NH 03301). At Oberheiden, P.C. – we never entrust your case to unproven junior associates, paralegals, or legal assistants. Our experienced senior New Hampshire federal criminal defense lawyers have made a career out of representing clients in exclusively federal litigation. Disputing the Government’s Evidence –Is the government’s evidence admissible in court under the law or is it inadmissible under grounds such as the “fruit of the poisonous tree,” or hearsay circumstances? Remember- the government is the one that has to prove your guilt beyond a reasonable doubt in a court of law, and your attorneys will do everything they can to question to government’s evidence against you. Asserting Constitutional Violations – Your New Hampshire federal criminal defense lawyers can raise arguments based on potential Constitutional violations such as agents not reading your Miranda rights to you, or reading them too late in the process. Your attorneys will know which arguments to raise during the case because they could have a big impact on the outcome of your trial. Asserting Affirmative Defenses – Unlike a typical legal defense, an affirmative defense does not focus on disputing that certain acts were committed, but instead focuses on showcasing that these acts do not constitute a crime under the circumstances involved. Challenging the Sufficiency of the Government’s Case – The federal prosecution has to prove beyond a reasonable doubt that you are in fact guilty of the crimes alleged against you. In order to accomplish this, the U.S. Attorney’s Office must prove that numerous “elements,” of a federal crime are present in order to prove guilt and secure a conviction. Oberheiden, P.C.’s team of New Hampshire federal criminal defense lawyers is led by our founding attorney, Dr. Nick Oberheiden. Our defense team is comprised of numerous senior attorneys, many of whom served with the U.S. Department of Justice (DOJ) or as prosecutors prior to entering private practice. Our law firm has garnered a national reputation for federal litigation excellence all across the U.S., and not just in New Hampshire. Our attorneys will custom craft an effective strategy to shield you from federal criminal conviction. We know what is on the line and our attorneys will begin by providing you with a free and confidential case assessment. You can contact Oberheiden, P.C.’s experienced New Hampshire federal criminal defense attorneys 24/7 by calling us today. If an attorney is not immediately available, we will schedule an appointment that is convenient for you as soon as possible. If you are facing charges in New Hampshire, we urge you to contact us to speak to a member of our New Hampshire federal criminal defense attorneys team. Call us at (888) 519-4897, or tell us how to reach you online now.